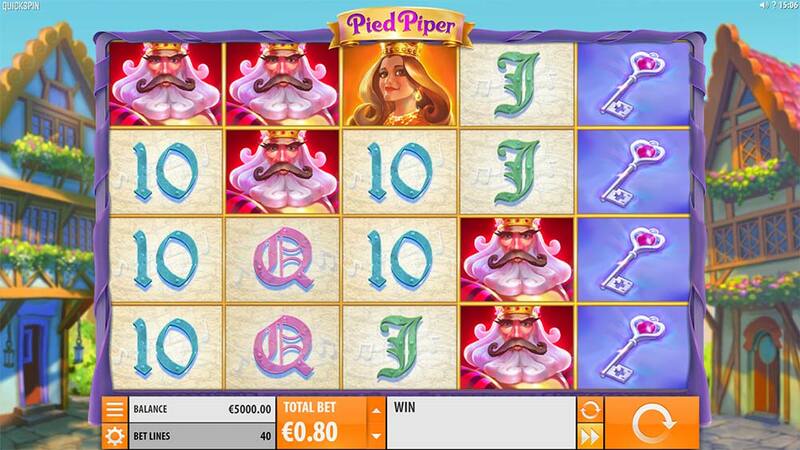 Play the new Pied Piper Slot from Quickspin before it’s official release date! The next Quickspin slot on the horizon is the Pied Piper Slot with an official release date of the 9th January 2018, fortunately, LeoVegas Casino already has this slot live and playable before this date. The Pied Piper slot is based on the famous legend from the town of Hamelin, but this time around instead of chasing away the rats with his flute you instead you want to be triggering the walking wild feature were mice and the pied piper dance across the screen granting wins. 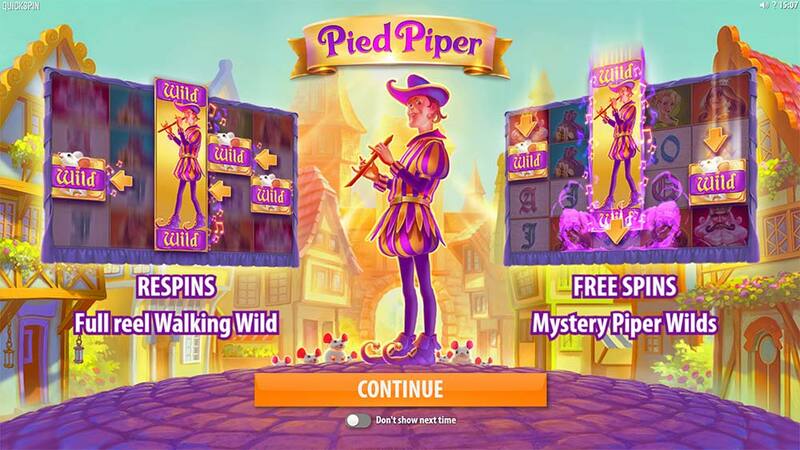 The Pied Piper slot is a regular 5×4 reel slot with 40 fixed paylines, there are a number of base game and bonus features that include Piper Respins, Mystery Re-triggers, Free Spins and a special Piper Wild symbol that initiates the walking wilds re-spins. The special Piper Wild symbol is 4 high stacked wild symbol that when landing fully on a reel triggers the re-spin mechanic, any additional mice will be held in place and then walk from right to left over the reels, this can also re-trigger at the end granting more re-spins and new chances to land additional Wild symbols. 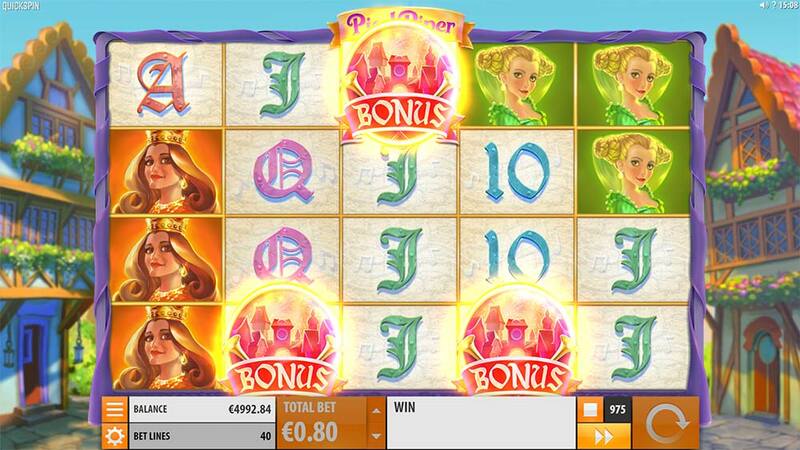 The main free spins bonus round is triggered by landing 3 bonus scatter symbols on the middle reels and grants an initial 10 free spins, during the bonus round there are extra Wild Mice added to the reels on every spin, along with the chance of the special Piper Wild activating granting lots of re-spins. Check out the gameplay video below to see all of these bonus features in action. Piper Respins – When this special 4×1 Wild symbol lands on the reels the Piper Respins feature is triggered, all mice symbols are held as wilds and the re-spins walk one reel to the left for each re-spin. Mystery Re-trigger – Sometimes at the end of the Piper Respins feature the feature can re-trigger with the piper re-appearing on the 5th reels, granting 5 more re-spins. 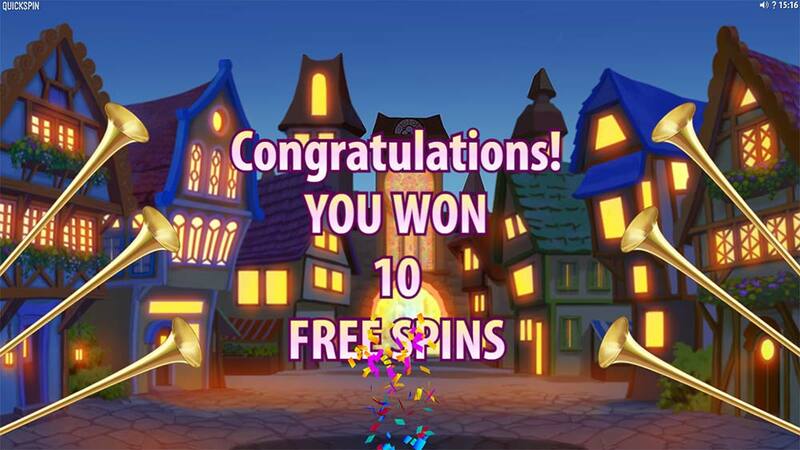 Free Spins – 10 Free Spins are awarded along with a guaranteed 1-6 Mice Wild symbols on each spin, as well as the Piper Re-spins occurring more frequently. Piper Wild symbol – This special 4×1 stacked Wild symbol is present on reels 3, 4, and 5 and triggers the Piper Respins feature. 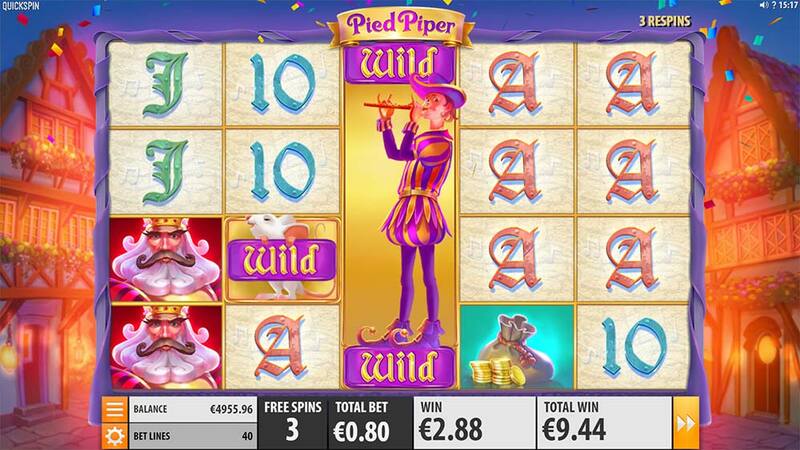 We found the Pied Piper Slot to be quite enjoyable whilst playing, for fans of slots such as Jack and the Beanstalk (NetEnt) you will be immediately at home with the Walking Wild feature on this slot. Lots of little nice touches make this slot worth checking out, particularly the Mystery Re-Trigger feature really adding to the suspense during the Walking Wild feature. 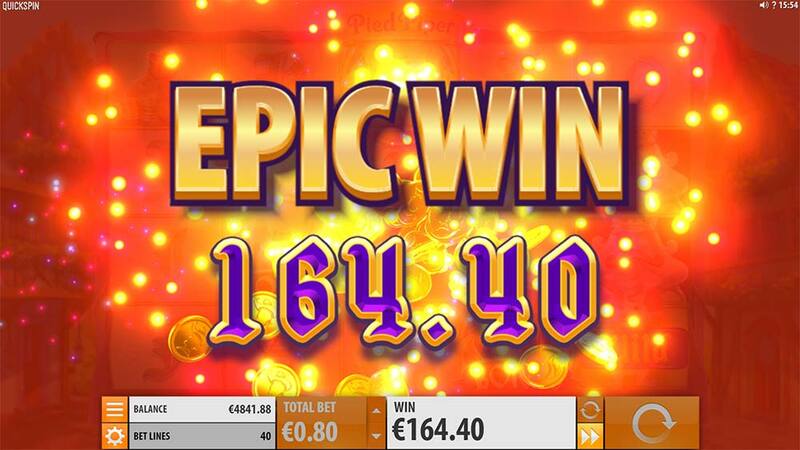 Whilst with most Quickspin slots the variance and volatility aren’t too high but we did manage a bonus round over 200x stake, with lots of re-spins really adding to the length of the bonus round. 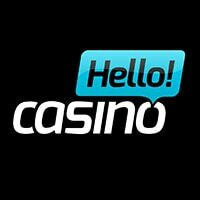 Definitely, one to check out if you are already a fan of Quickspin slots or enjoy the sticky wilds style mechanics on slots.